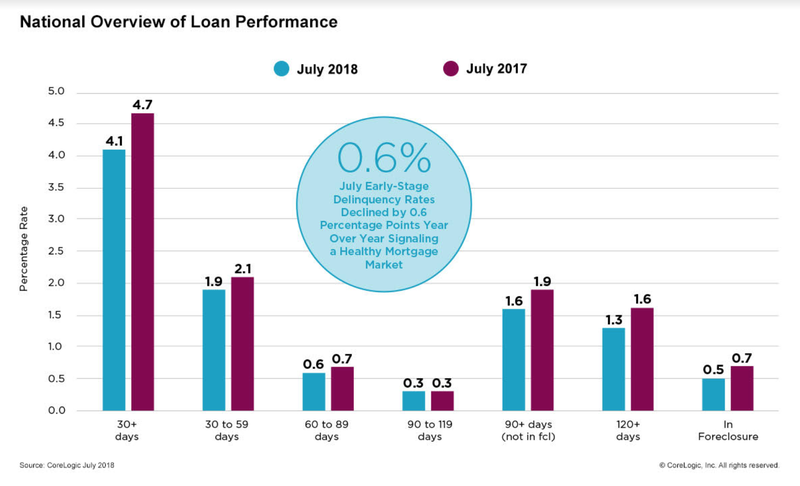 Mortgage delinquency and foreclosure rates hit a 12-year low in July, continuing a streak of month-over-month declines, according to CoreLogic’s latest Loan Performance Insights report, released Tuesday. Nationwide, 4.1 percent of mortgages were delinquent, meaning late by more than 30 days, compared to 4.7 percent over the same period last year and 4.3 percent in June, according to the analysis. Foreclosures, in which a house is seized by the government due to the owner’s inability to pay the mortgage, were also down to .5 percent from 0.7 percent during the same period last year. At no point since 2006 were either the foreclosure or the delinquency rates lower. CoreLogic predicts Hurricane Florence, which brought major floods and power outages across the Carolinas and parts of Virginia last month, could cause an upward spike in delinquency and even foreclosure rates in the months to come. In general, any major natural disaster is likely to cause a spike in delinquency rates as homeowners take time to assess damage and figure out whether to make repairs or sell. In July, Florida and Texas — states that are still struggling to recover from the damage wrought by Hurricanes Harvey and Irma in 2017 – saw their serious delinquency rates grow to 2.9 percent and 1.8 percent, respectively. “The destruction of homes and disruption to local commerce caused by natural disasters lead to a subsequent spike in local delinquency rates, even for homes that were untouched,” Nothaft said. According to CoreLogic, almost half a million homes in North Carolina were affected by Hurricane Florence’s heavy storms — along with 109,000 homes in South Carolina and 28,000 homes in Virginia. Time will show just how these numbers affect state mortgage and foreclosure rates.